LEARN to stop saying I’ll never…apparently!! When I was 19 I swore I never wanted to have children. I hated men. I think I just hated the world at that point… broken-hearted, angry, and lost for the future I thought I had planned… immaturity… whatever it was, I said it. I continued on saying, “I will never…” and every TIME it’s come back to bite me. I’ll never drive a mini-van. Here it is. 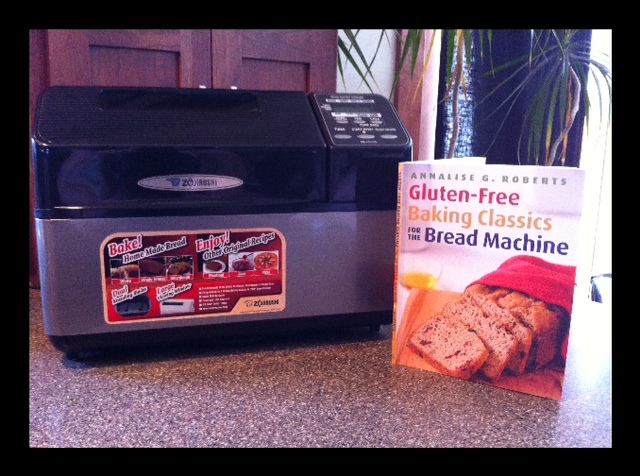 My bread making machine. *Gulp* The first loaf is in the maker… I’ll let you know how it turns out! Here I am… making bread… eating crow, and laughing at God. Oh Lord – what a sense of humor you have. I am SO very wrong, and your ways are far greater than I ever imagine. In my small hopes of my future, I am SO thankful you laid a greater plan… and love me more than anyone could. With 8 children, with homeschooling, with providing us a vehicle to be together safely, as our family has grown (and I have grown in maturity), and YES… with the possibility to make bread my children can eat and be healthy. We eat a lot less bread, and I personally don’t eat it at all… but I’m glad I know exactly what is IN this bread (we do love Udi’s bread though). Thank you Lord – for loving me, and listening to ways I need broken. Posted on May 16, 2012, in Celiac/Gluten Sensitivity, Food To Try, Label Reading, Our Struggles and tagged celiac disease, gluten free bread, making gluten free bread. Bookmark the permalink. 2 Comments. Just wanted to let you know that STUBBS marinades are AWESOME!!!! My very favorite. I just noticed on one of the lables-Steakhouse marinade-it said nutritious gluten free ingredients. So I thought I’d share it with you.